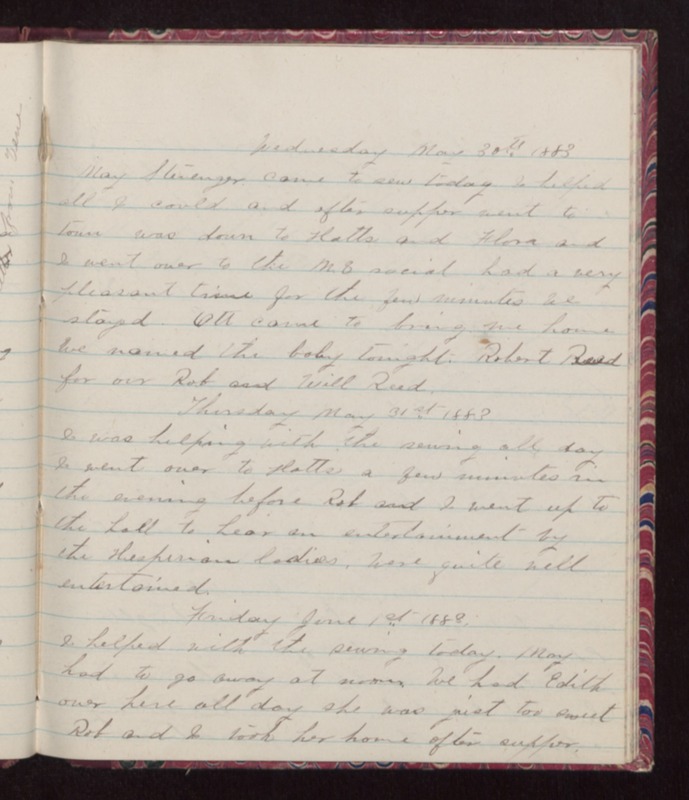 Wednesday May 30th 1883 May Stenenger came to sew today I helped all I could and after supper went to town was down to Hatts and Flora and I went over to the M 8 social had a very pleasant time for the few minutes we stayed. Ott came to bring me home. We named the baby tonight. Robert Reed for our Rob and Will Reed. Thursday May 31st 1883 I was helping with the sewing all day I went over to Hatts a few minutes in the evening before Rob and I went up to the hall to hear an entertainment by the Hesperian Ladies. Were quite well entertained. Friday June 1st 1883 I helped with the sewing today. May had to go away at noon. We had Edith over here all day she was just too sweet Rob and I took her home after supper.